This is a checked version (list all), approved on 2 February 2014. New changes may have been made. 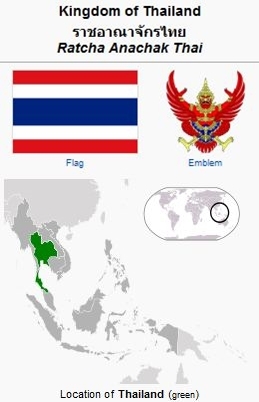 Thailand (formerly Siam) is a country in Southeast Asia. It is bordered to the north by Burma and Laos, to the east by Laos and Cambodia, to the south by the Gulf of Thailand and Malaysia, and to the west by the Andaman Sea and the southern extremity of Burma. The country is a constitutional monarchy. The largest city in Thailand is Bangkok, the capital, which is also the country's center of political, commercial, industrial and cultural activities. Thailand is the world's 50th largest country in terms of total area, with a surface area of 513,120 km2 (198,115 sq mi), and the 20th most-populous country, with an estimated population in July 2010 of 65,998,436. About 75% of the population is ethnically Thai, 14% is of Chinese origin, and 3% is ethnically Malay; the rest belong to minority groups including Mons, Khmers and various hill tribes. The country's official language is Thai. Its primary religion is Buddhism, which is practiced by around 95% of all Thais. Mennonite Central Committee (MCC) began involvement in Thailand in 1960 by placing workers at the Prae Christian Hospital. Later that year, two Pax volunteers began work at an experimental farm in Chiang Rai. From 1963 to 1975 MCC had no programs in Thailand. In 1975 two MCC workers from Vietnam began working in Thailand with the Church of Christ in Thailand. In 1979 MCC began working with Indochinese refugees flooding into Thailand (job creation, social services, peace concerns, agriculture and education). The MCC office in Bangkok also provided logistical support for MCC work in Indochina. There were eight MCC volunteers in Thailand in 1987. In 2000 Mennonite Brethren Mission and Service International (MBMSI) organized a team of missionaries, known as Team 2000, to begin work in Chonburi, Thailand. Various ministries and social programs were established, including ESL classes and a ministry to HIV-AIDS orphans. After the devastation caused by the December 2004 tsunami, a number of MBMSI teams worked to construct new homes. After several Mennonite Brethren congregations were planted in Thailand, a conference, called the Thai MB Foundation, was formed and officially recognized by the government in 2009. In 2014 the Thai MB Foundation had 15 congregations with 1,500 members. Mennonite World Conference. "Mennonite and Brethren in Christ Churches Worldwide, 2009: Asia & Pacific." 2010. Web. 28 October 2010. http://www.mwc-cmm.org/en15/files/Members 2009/Asia & Pacific Summary.doc. "Thailand Mennonite Brethren Foundation." Mennonite Brethren Herald (February 2014): 7. Wikipedia. "Thailand." Web. 28 October 2010. http://en.wikipedia.org/wiki/Thailand. Stauffer, Brenda and Richard D. Thiessen. "Thailand." Global Anabaptist Mennonite Encyclopedia Online. February 2014. Web. 20 Apr 2019. http://gameo.org/index.php?title=Thailand&oldid=112555. Stauffer, Brenda and Richard D. Thiessen. (February 2014). Thailand. Global Anabaptist Mennonite Encyclopedia Online. Retrieved 20 April 2019, from http://gameo.org/index.php?title=Thailand&oldid=112555. Adapted by permission of Herald Press, Harrisonburg, Virginia, from Mennonite Encyclopedia, Vol. 5, p. 879. All rights reserved.